The Guardian’s Steve Busfield and Paddy Allen have produced a rather nice click-through interactive, showing how figures at News International fit into the phone hacking / blagging scandal. 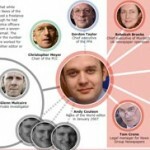 As noted on this blog this morning, the Guardian reported that Conservative director of communications Andy Coulson (former News of the World editor) is under pressure to defend “his knowledge about the illegal activities of his journalists amid new allegations about the paper’s involvement with private detectives who broke the law”. For those interested in producing news interactive and visualisation features, please see my post from last week: ‘Data visualisations that tell the news’ – packed with links suggested by the FT’s deputy interactive editor, Cynthia O’Murchu. This entry was posted in Handy tools and technology, Legal, Online Journalism and tagged Andy Coulson, Cynthia O'Murchu, News Corporation, News International, Steve Busfield, The Guardian on February 25, 2010 by Judith Townend. Guardian News & Media has this morning announced the heads of ‘its new integrated production, media and environment teams’, which are to be called pods. Appointments to its sport and picture desks were also announced. Jon Casson: head of production. Casson will be responsible for all sub-editors in the integrated production and subbing teams across the Guardian, the Observer and guardian.co.uk, and will also do news subbing. Andy Beven: head of production, business and pods. He will line manage the subbing teams within the pods and the business desk. Jason Deans has been appointed editor of MediaGuardian.co.uk. This entry was posted in Online Journalism and tagged andy bevan, Andy Beven, business and pods, Damian Carrington, David Marsh, David Marsh, editor, guardian, Guardian.co.uk, head, head of production, Jason Deans, Jon Casson, Management Change, media coverage, MediaGuardian.co.uk, news editor, pod, production editor, Steve Busfield, technology pod, The Guardian, the Guardian Technology, The Observer on October 29, 2008 by Judith Townend.